After 30 years, my musical collaborator Paul Ford retired. I wasn't sure if that meant I would have to as well. But my dear friend Bob Hurwitz introduced me to Thomas Bartlett, who introduced me to an entirely new way of making music—in his studio, hours of playing, singing, and recording, never searching for the illusion of perfection. We’ve shared our music-making journey in the form of the new recording MANDY PATINKIN: Diary. Singing onstage is one of the great joys of my life so I’ve created a new concert - a merger of my favorite Broadway and classic American tunes with selections from the recording of Diary. 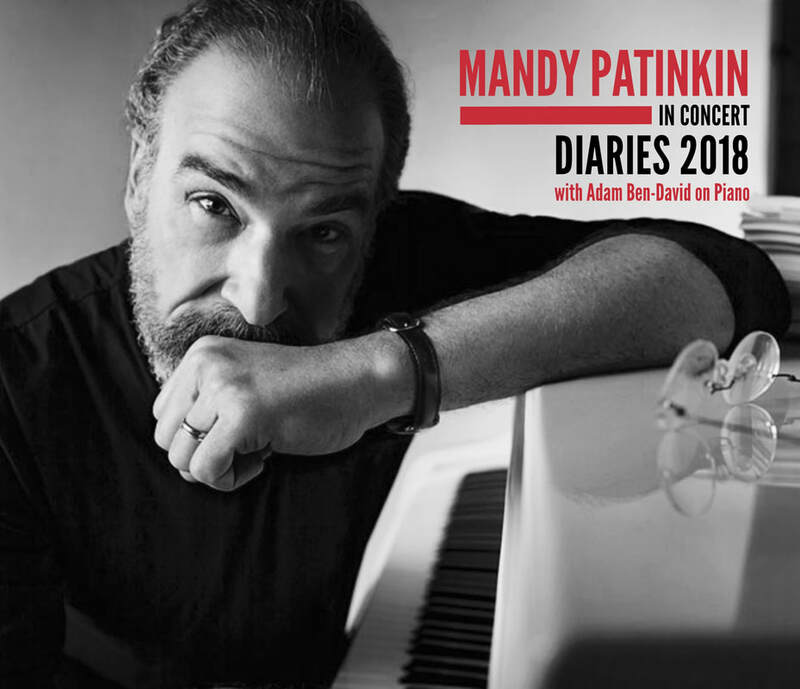 I’m very happy to share MANDY PATINKIN IN CONCERT: DIARIES 2018, with Adam Ben-David on piano. To some, he’s the Tony Award-winning revolutionary from Evita who grew into a bonafide Broadway star in Sunday in the Park with George. To others, he’s the Emmy Award–winning Best Actor from “Chicago Hope” or CIA Agent Saul Berenson from the award-winning Showtime series "Homeland." And to others still, he will always be the man whose name is Inigo Montoya, the swashbuckling swordsman in The Princess Bride. Whichever role you know him for, Mandy’s favorite is reaching out to live audiences with the power and the passion of popular song. He belongs to the special breed of singer who doesn’t merely dramatize songs, but incorporates them into his very being. And the result, Mandy Patinkin In Concert, is nothing short of electrifying. His interpretations of popular standards come straight from the heart, mesmerizing audiences from coast to coast. From Rodgers and Hammerstein to Stephen Sondheim, Harry Chapin, and back to Irving Berlin and Cole Porter. ​It's the end of the world as we know it. A flood of biblical proportions leaves us with only two people on Earth, who discover their common language is song and dance. Together they chronicle the rise and fall, and hopeful rise again of humankind, through music that runs the gamut from Rodgers & Hammerstein and Stephen Sondheim all the way to Patty Griffin and R.E.M. Two legendary Broadway performers. A once-in-a-lifetime theatrical event. ​An Evening with Patti LuPone and Mandy Patinkin reunites these Tony Award®-winning virtuosos (and lifelong friends) for the first time since Evita. Much more than a concert, this is a unique musical love story told entirely through a masterful selection of the greatest songs ever written for the stage. Funny, passionate, intimate and utterly unforgettable, this is An Evening no fan of musical theatre – or two of the most acclaimed performers of our time – can afford to miss. Broadway legend Mandy Patinkin and opera super-star Nathan Gunn combine their musical talents to create a unique and powerful concert, An Evening with Mandy Patinkin & Nathan Gunn. The eclectic programme features solos and duets – songs from musicals as well as a selection of opera, traditional folk and pop. Nathan Gunn has made a reputation as one of the most exciting and in-demand baritones of the day. He has appeared in internationally renowned opera houses such as the Metropolitan Opera, Royal Opera House, and Paris Opera and as a concert artist with symphony orchestras around the globe. His solo recordings includeJust Before Sunrise and American Anthem. *Do not send photo requests, fan mail, or personal requests to this email.